Every fifth contemporary Russian is related to the British Royal House of Windsor, and such a wide spread of the noble genes amongst Russians might be attributed to the extensive blood ties between Imperial Russia’s nobility and their European counterparts, and the social chaos entailing the Russian Revolution 100 years ago. Kristian Rouz – Recent DNA research by the Moscow, Russia-based genetic research company, Genotek, has revealed that roughly one-fifth of all Russian people are genetic relatives of the House of Windsor, the ruling dynasty of the United Kingdom. Other prominent historical figures, also related to Queen Elizabeth II, include Nicholas II, Russia’s last Emperor, and Marie de Medici, Queen of France, who belongs to the celebrated Medieval-era financial Medici clan of Northern Italy. The study is based on the analysis of the genomes of the Russian people and those of the prominent European dynasties of the past and present. The DNA breakdown has shown that about 20 percent of contemporary Russians share the same haplogroup as members of the Windsor dynasty, meaning that the test sample providers had common ancestors centuries ago. “Three years ago we did a DNA test for Vladimir Zhirinovsky (one of modern Russia’s prominent politicians and public figures), and the results showed that he has common ancestors with Napoleon and Einstein. One of Zhirinovsky’s haplogroups, E1b1b1, is quite interesting – it is also found in the DNA of Adolf Hitler, Vlad Tepes (also known as known as Vlad the Impaler or Dracula) and Benito Mussolini,” – Valery Ilinsky, director of Genotek, said. For the study, the researchers analyzed a sample of 2,500 genomes from across Russia and Ukraine, including such cities as Moscow, St. Petersburg, Yekaterinburg, Sochi, Krasnodar, Rostov-on-Don, Vladivostok, Novosibirsk, Simferopol and Kyiv. Roughly half of the genome samples were male genomes. On their maternal side, most contemporary Russians belong to the mitochondrial group (haplogroup) H, which first emerged amongst the peoples of the Middle East and South East Asia about 30 thousand years ago. The carriers of this haplogroup subsequently migrated to Europe roughly 20-25 thousand years ago, and today, some 41 percent of the Europeans share this haplogroup. It was this particular haplogroup that allowed the researchers to discover the blood ties between 20 percent of Russians and the Queen of England Elizabeth II, along with Maria de Medici among other prominent figures. The discovery proves that ethnic Russians are genetically European as the percentage of the non-European DNA found amongst the samples provided is insignificant. The findings of the study also provide further evidence of closer ties between Russians and the other peoples of Northern Europe. Russia’s last emperor, Nicholas II of the House of Romanov, was a close relative to many European monarchs of the early 20th century, including the German Kaiser Wilhelm II of the House of Hohenzollern, and monarchs of the Houses of Saxe-Coburg-Gotha, Hanover and Windsor. Most of Imperial Russia’s nobility had blood ties with the House of Romanov or the House of Rurikid, the latter being direct descendants of the Viking invaders, whose presence was prominent in 10th-century Russia, 11th-century England, as well as France, and Sicily of the same era. After the Bolshevik Revolution and the subsequent social chaos, these genomes might have spread widely amongst the broader Russian populace, which explains their presence in 20 percent of contemporary Russians. Meanwhile, on the paternal side, 25 percent of contemporary Russians share the R1a1 haplogroup, which emerged some 10 thousand years ago in the North Caspian region. This haplogroup is also found in the DNA of such figures as Sir Francis Drake, the 16th-century English sea explorer, merchant and privateer, and King Willem-Alexander of the Netherlands. An earlier study by Genotek found that only 16.2 percent of contemporary Russians carry the genomes of the original peoples that inhabited the Russian heartland centuries ago. Roughly 19.2 percent of the modern Russian genome is similar to those of the Ukrainians and Belorussians, whilst some 13.1 percent are shared between the Russians and the Finnish people, and another 6.3 percent of the Russian DNA are genomes typical for the people of Hungary, or Magyars. It is said that pets, particularly dogs and cats, tend to look like their owners. Recent evidence points to the accuracy of that remark. Americans, a new report has revealed, no longer have the monopoly on mammalian obesity, as their pets are now shown to be getting fatter, too. The annual Banfield Pet Hospital State of Pet Health report for 2017 shows that 33 percent of pets brought to the facility in 2016 were overweight or obese. The 2017 Banfield report documented the habits and health of some 2.5 million dogs and an estimated 500,000 cats brought to their 800-odd US veterinarian stations during 2016. The trend toward fatter pets was first observed in 2012, according to Banfield veterinary research associate Dr. Kirk Breuninger. “More than 20 disease conditions have been linked with pets being overweight,” he commented. “Some may say, ‘My pet looks cute being pudgy or plump,’ [but] ultimately carrying those extra pounds contributes to exacerbating these diseases,” he added, according to USA Today. The Banfield report noted that obese pets are much more likely to suffer from arthritis, and pointed out that fat dogs in particularly are vulnerable tracheal collapse, which can cause asphyxiation and an early death. The report added that fat cats and chubby puppers are also much more likely to cost a bundle when veterinarians have to treat their ailments, as pet owners not uncommonly drop tens of thousands of dollars only to prolong the suffering of their animal friend. Factors that contribute to pet weight gain include the same obvious culprits that bedevil bigger humans. A little exercise goes a long way, he suggested, and that goes for the pet’s owners, too. “Even small changes can have big long-term effects,” Breuninger said. Cyber security experts registered a new Trojan virus in addition to the Petya ransomware that was used to attack computers in a number of Russian and Ukrainian companies on Monday night. 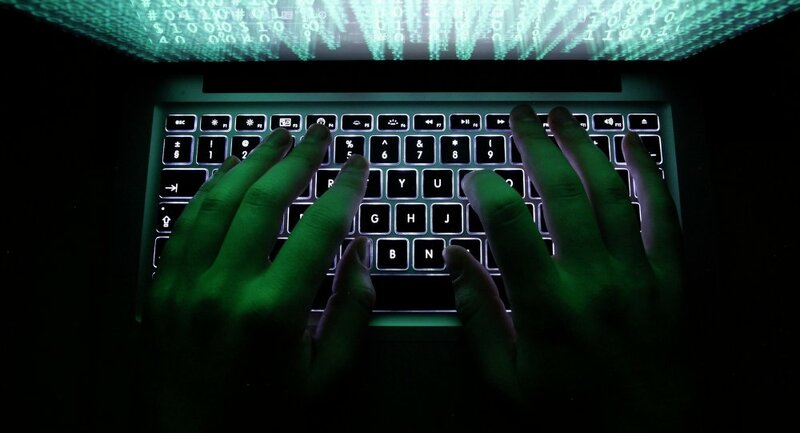 In an interview with Radio Sputnik, cyber security expert Andrei Masalovich said that the number of new advanced cyberattacks is likely to increase. The anti-virus company Dr.Web fixed cyberattacks using a cryptographic virus on a number of companies in the Russian Federation and Ukraine. The Petya ransomware was used in a large-scale attack on oil, telecommunications and financial companies in both countries, blocking computers and demanding $300 in bitcoins, Group-IB, which specializes in early detection of cyber threats, told Sputnik on Tuesday. Later, the head of Kaspersky Lab’s international research team, Costin Raiu, said that the virus had spread all over the world. Information security expert Andrei Masalovich told Sputnik that attacks with new viruses are likely to occur more and more often in the future. “Now, unfortunately, we can expect dozens of attacks with such viruses. Since February more than 120 cyber software created by the CIA and the NSA have been released by WikiLeaks. They were created as cyber weapons to attack military and infrastructure in certain countries, and now they fell into hackers’ hands. So, we must be ready that hackers will use it again and again,” Masalovich said. According to the expert, many threats, that until recently seemed fantastic, are becoming a real part of our life. “We woke up on some new “Planet Hollywood.” And I don’t quite like it, because now there are so many Trojans, which were rarely created before. Many of them fell into the hands of hackers, and so we must be prepared for a situation when it will ‘fever’ every week,” the expert noted. At the same time, Masalovich stressed that there is no need to panic. According to him, there is quite efficient protection against new threats. “We must be able to defend ourselves, there are antivirus software that is capable of protecting us again real threats. Moreover, viruses spread via e-mails with suspicious links, so one shouldn’t click on anything. People are capable of protecting themselves, and then cyber experts will join. If they can’t immediately find the criminals, then at least they can start gathering information about their attacks’ “pattern.” I must say that hacker groups conduct their attacks according to a similar pattern. And at some point, when they make a mistake, the entire network can be disclosed,” Masalovich concluded. 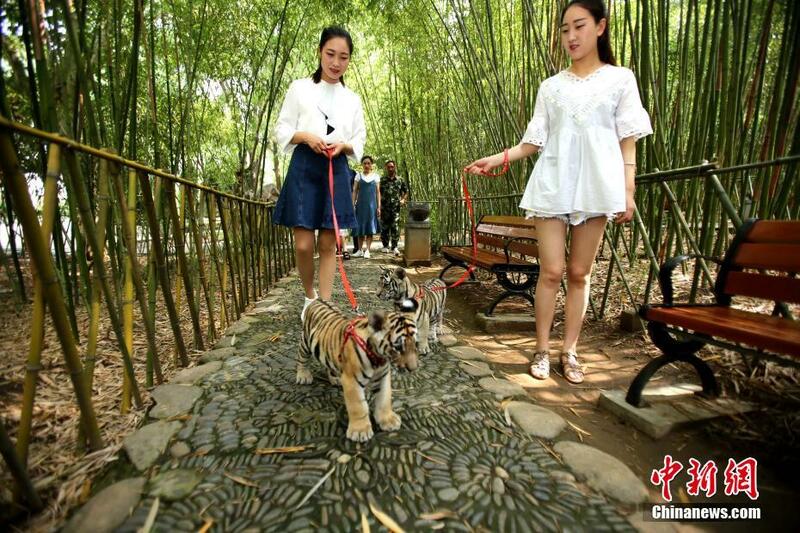 Several women walked two tiger cubs on June 22 at a park in Luoyang, Henan province. The real-life juxtaposition of “Beauty and the Beast” attracted a great deal of attention from visitors. 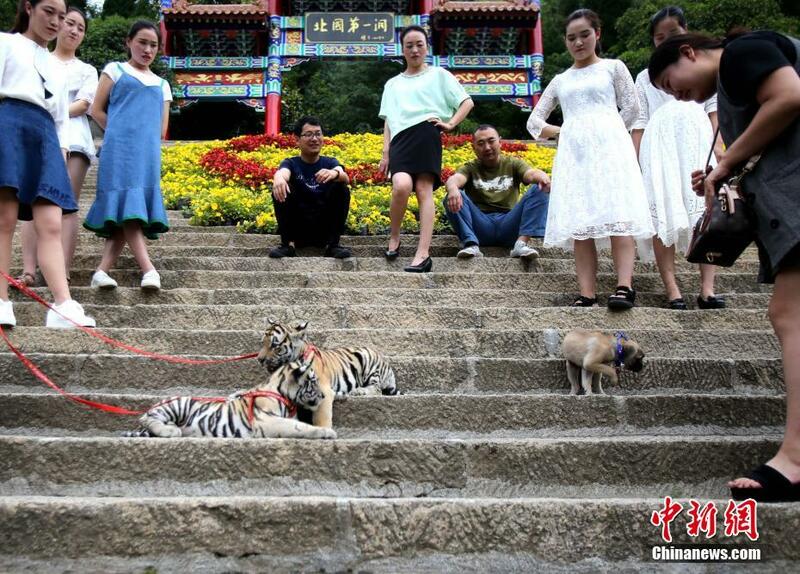 The two tigers were bred by a local wildlife park. 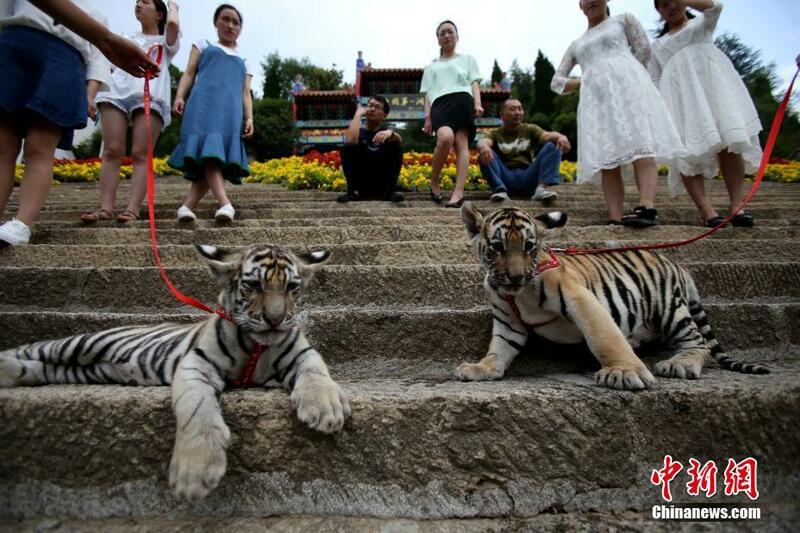 According to an employee of the park, they now have a chance to freely experience nature while they are still young. 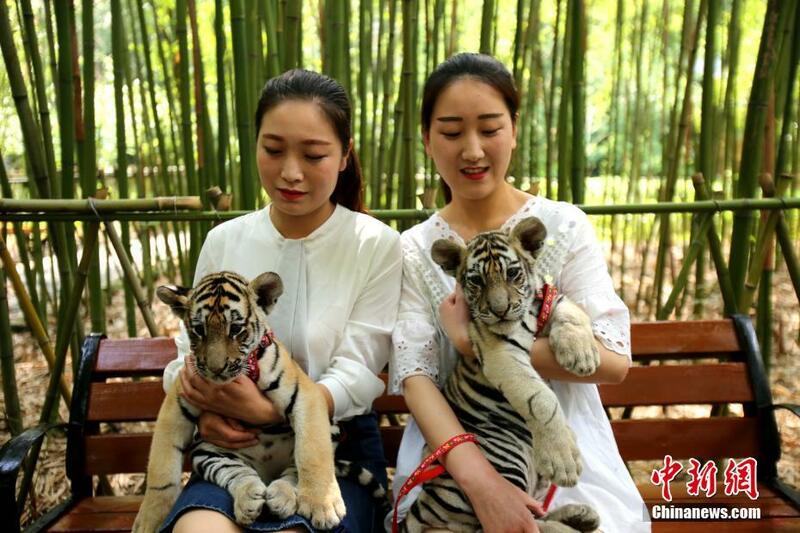 They will be placed in an enclosure once they get older, the employee explained. A deep-fried insect eating competition—including bamboo worms, dragonflies, and silkworms—held on June 25 in the scenic area of Lijiang in southwest China’s Yunnan province caught people’s eyes, China News reported. A man surnamed Peng from Chongqing Municipality won the competition after downing 1 kg of insects within 5 minutes and was rewarded with a gold bar. China exported cooked poultry meat to the U.S. for the first time, signifying that thecountry has reached an international standard of poultry processing and qualitysupervision. 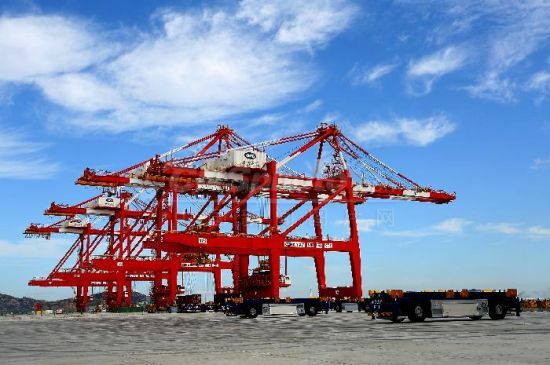 Shipment of cooked poultry meat processed by Changguang Food Plant, which operatesunder the Nine-Alliance Group, a food factory based in Qingdao, a city in east China’sShandong province, arrived on June 26 in the U.S., according to the Shandong Entry-ExitInspection and Quarantine Bureau. The quarantine bureau attaches great attention to the export. 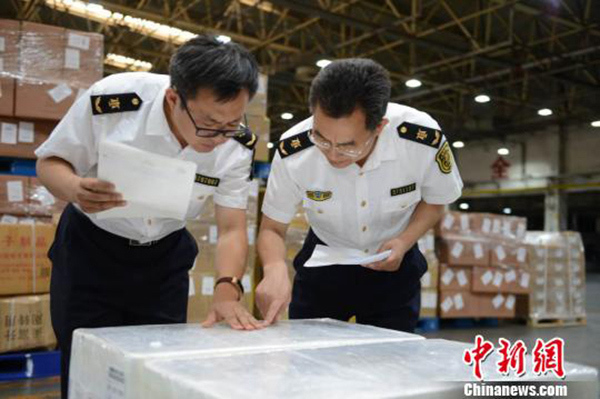 Before the meat left thefactory, quality-related documents and production activities were carefully inspected inorder to make sure they meet the requirements of the U.S. side and the GeneralAdministration of Quality Supervision, Inspection, and Quarantine, China’s top qualitywatchdog. The cooked poultry meat will be lab tested when it arrives in the U.S., which is inaccordance with the regulations of both countries. The U.S. officially recognized that China has food production and food safety supervisionsystems that are equivalent to its own in March 2016. China-grown poultry will beauthorized to enter the U.S. market after the latter enacts a law to officially approve theimport. Chinese nationals spend an average of three hours a day on their smartphones, rankingsecond in the world after Brazilians who spend two additional hours on their phones,according to a survey by a German internet company. In just a few years, smart phones have transformed from a communication tool into a dailynecessity, allowing people to order food, hail a cab, shop online, manage wealth, andsocialize at their fingertips. But with such convenience comes overuse and addiction. People always feel uncomfortablewhenever they are not with their smartphones. The survey found that Brazilians spend the most time on their smartphones, about fivehours a day, followed by Chinese, who spend three hours on their phones. People in theUnited States, Italy, Spain, South Korea, Canada, and the United Kingdom spend morethan two hours a day on their mobile devices. According to UK mobile technology consultant Tomi Ahonen, people look at their phonesabout every 6.5 minutes. This means they check their phones 150 times a day over a 16hour period. Children are also likely to follow their parents’ habit. A survey of 1,000 children rangingfrom ages 0-5 showed that 80.4% of children use smartphones, and more than half of theirparents believe that mobile phones put their children at ease. Fear of missing out contributed to the high amount of phone checking, said Zhu Yanshao, aresearcher with the Division of Social and Engineering Psychology at the Institute ofPsychology under the Chinese Academy of Sciences. They hope to finish their personalaffairs in the shortest possible time, and it becomes a habit, Zhu added. 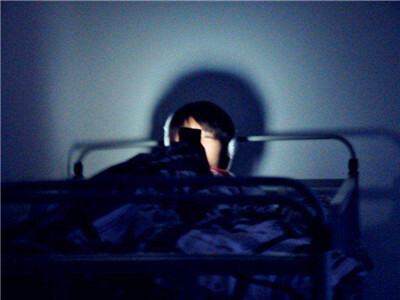 The lack of leisure activities is the main reason for Chinese people’s smartphone addiction.Offline activities in China, such as sports, travel, art shows, and reading are not as popularas they are in other countries and regions; on the contrary, China has 668 million netizens,eight-nine percent of whom browse the internet with their phones. The internet is howthey mostly kill the time. Though smartphones bring entertainment and conveniences, they can have negativeeffects on health. Staring at a screen for a long period of time can cause eye or spinedamage. Smartphones are also associated with lower quality of sleep, and high bloodpressure and an elevated heart rate are also unfavorable results. China’s new bullet train model “Fuxing” will be mass-produced, said the Shanghai RailwayBureau (SRB) on June 26. 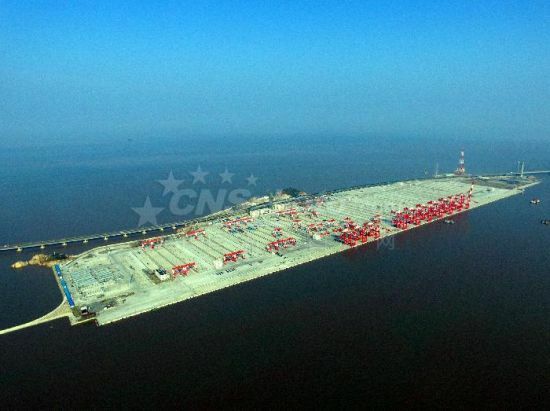 The new high-speed train debuted on the Shanghai-Beijing line on Monday. The current model “Hexie” began service 10 years ago, and has gone through half of itsprojected life span. The second generation bullet trains are expected to replace theirpredecessors when the latter reaches the end of its life. 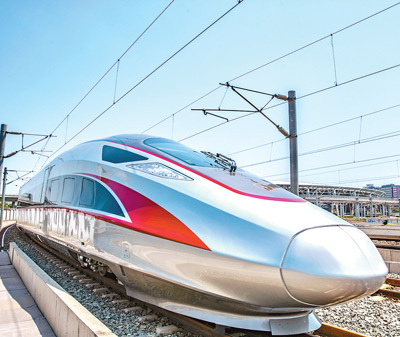 Currently, the Fuxing high-speed trains are running at a speed of 350 kilometers per hour. “The latest generation has undergone testing at 420 kilometers per hour, but we restrictedthe top speed due to multiple factors,” said Ye Dan, vice director of SRB’s locomotivemanagement department. With greater traction power, Fuxing’s acceleration performance from 0 to 200 kilometersper hour has improved by 5.4%. Meanwhile, the new model has reduced the dragcoefficient by 11%. As a result, Fuxing shows a 17% energy savings compared to Hexie. In addition, Fuxing’s projected life span is a decade longer than Hexie’s 20 years. Accommodating 576 passengers, Fuxing bullet trains have optimized its sound insulation,lowering operation noise levels by two decibels. More charging sockets and USB ports havealso been added. According to Ye, the Fuxing high-speed trains have a 6,600 kilometers maintenance cycle,greater than Hexie’s 4,400 kilometers. “By doing so, we have extended our time ofoperation and improved the service efficiency of the locomotives,” the vice director added. Scientists at the China Academy of Engineering Physics (CAEP) announced recently that they have perfected a laser gun capable of shooting down drones flying at low altitudes. The laser system performed well during experiments and tests, shooting down over 30 small aircraft, said a CAEP employee. The laser gun disables drones after shooting lasers that burn and erode the target’s surface and functional parts. In this way, it interferes with the drone’s remote control and navigation system. The system can destroy targets within five seconds, causing no collateral damage. A single system defense set can cover an area of 12 square kilometers. In April, 19 drones flying illegally over various Chinese airports forced many flights to be canceled. 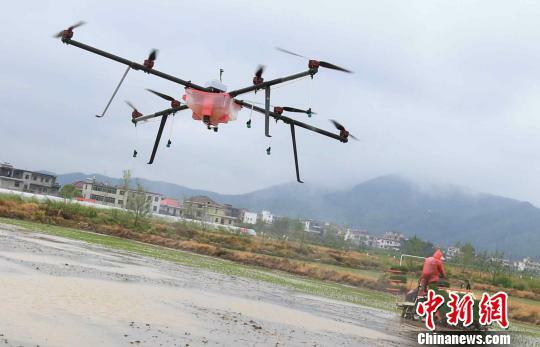 Though China has required civilian drones weighing more than 250 grams to be registered under real names since June 1, experts nevertheless warn that occasional hostile flights cannot be prevented. The laser system has become a popular way to counter these drone issues. It can be dismantled for easier transportation. In addition, in order to effectively detect and guide the laser system, a complementary radar system is designed to work with the laser. The laser system is the first of its kind in the world.